The Garda is beckoning on traffic approaching from the front. You must not proceed to the right. The Garda is beckoning on traffic approaching from either side. You must not proceed to the left. 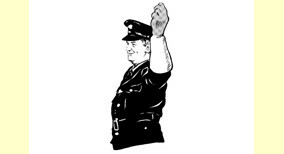 Explantion: When approaching a garda giving this signal you may proceed.